Joe Konrath just got rid of about 300 paper books, books he never thought he would part with. Why did he? 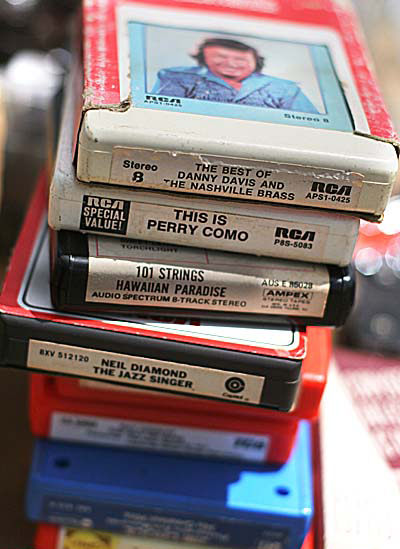 You got rid of your 8-track tapes, and floppy disks, and Betamax. You got rid of your Razr and bought a smart phone. You threw out the tube TV and went with an HD flatscreen. You sold your Atari 2600 at a garage sale for $5, and now play Wii with your family. The new tech replaces the old tech. Books are just more of the same. You may not believe me. You may think you'll take your paper books with you to the grave. Do me a favor, and bookmark this page. Look at it again in 18 months. You'll see I was right. Joe's blog post is short and thought provoking: Digital Me. I'm afraid that I have to disagree with Joe's assessment of paperback books, or even hardcover books too, for that matter. His analogy paired electronic media...or their cousins, so to speak. You can always evolve something better if you stick to the same phylum, electronic in this case. But paperbacks are a totally different class. You don't even need power to read a paperback. What would happen with no power, a solar flare knocking all electronics out, or, though I hate to think about it...an EMP? And, this doesn't even "touch" on the subject that people like the...feel of books and their smell. I had to donate a lot of my books unfornately because I don't have a way of storing them or keeping them with me. That's one thing, but to do so just to have all your reading material made e-reader friendly is like putting all your eggs in one basket. On a sombre point, what would Burgess Meredith do in a current adaptation of the Twilight Zone's, Time Enough At Last? He wouldn't have been able to use his Kindle I'd suspect. Sorry, had to defend the "dogged-ear" underdog. I'm here to (partially) disagree, too. I'm willing to believe that tangible books MAY devolve into a niche market in the future. But, I don't think his examples of other obsolete techs are good. Betamax and 8-tracks never gained market share in the first place. Even if you replace those examples with VHS and audio cassettes then I'd point out that: 1) there are still some people using each of those and 2) both of those were replaced by technologies which provided notable improvements in terms of the ability to faithfully reproduce the source material. As great as they are, I would argue that eReaders are -- at best -- only an equivalent in terms of faithful reproduction. For something like an art book or "coffee table" book, I suspect (since I've never used one for said purpose) that they are a step back since many of those books have "display size" greater than that of eReaders. The big advantages I see eReaders having is in terms of storage space and ease-of-purchase/delivery. Those aren't advantages to sneeze at. But I don't see physical books going away anytime in the near future, even though they'll likely steadily lose market share. Time Enough at Last, I LOVED that episode ... well, The Twilight Zone was my favorite TV show ... but, still. Whenever anyone asks me what "irony" means I think of that episode. Joe's post also made me think of Court Martial, original Trek, about Commander Ben Finney and Kurt's lawyer who refused to use digital books. Thanks for the comment, you've made great points. I moved recently into a smaller place and gave away about 80% of my books. I have them on my iPad now and -- it feels like heresy to say! -- but I don't find myself missing the paper copies. Michael, great point about Time Enough at Last! I can actually 'see' that ending. It works. I agree, I think there always will be paper books, and that makes me happy. A little off topic, but I'm amazed by the number of folks who don't have a single book in their homes. I'm hoping that the ease with which they can read blogs, emails, etc., on their smart phones will seduce some people back to reading fiction. It's going to be an interesting decade or so while this shakes itself out!